Since they arrived on the island of Mata Nui, the Toa have been fighting against the vile Makuta. The six heroes have a new ally in Takanuva, the Toa of Light. Ancient Matoran legends speak of a mysterious Seventh Toa, who will free the island of Mata Nui from darkness. The signs of his coming are said to be the discovery of the Mask of Light and the appearance of a seventh star in the sky. Now both those events have taken place, and Takanuva walks the surface of Mata Nui at last! Destined to fight Makuta, Takanuva is a late addition to the world of Bionicle. He's constructed in the same manner as the other Toa Nuva, though his pieces are all molded in stark white plastic. He's got the new "hollow" arms and legs, and a series of gears in his shoulder. His Nuva armor is gold, giving him a nice contrast against the silver of the others. Takanuva's neck is a bit longer than his brothers', which makes him even taller than the rest and gives him an air of power and authority. The long neck looks fine when you put his mask on, though. Previously seen as Makuta's hands, the Kanohi Avohkii can project powerful beams of light energy and banish the shadows. The Avohkii brings understanding, turning anger to peace and enemies into allies. The mask has a linear look to it, almost suggesting rays of light frozen solid. 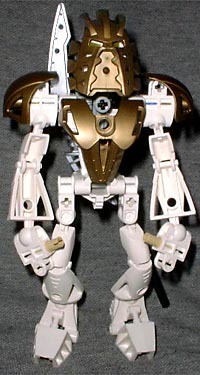 The set includes two versions of the Avohkii: one golden, like Takanuva's armor, and the other translucent with a slight golden dusting on the surface. A series of gears mounted in Takanuva's shoulder gives him his action feature: turn the knob on his back and he swings his hooked staff. The weapon is 7" tall, and can be easily mounted on Takanuva's back when not in use. Takanuva is not available by himself in a canister as the other Toa were: instead, he comes only in a deluxe set with the Ussanui, a sleek vehicle made from parts of Rahkshi and Bohrok-Kal. Looking somewhat like an odd motorcycle, the Ussanui is 10" long and really does look to be built from body parts, suggesting that the Toa defeated the Rahkshi, then tore them apart. The front is wider than the rear, making the vehicle look slightly alien. Three pieces function as landing gear for the Ussanui, and sliding a lever sideways rotates them up and away for flight mode. 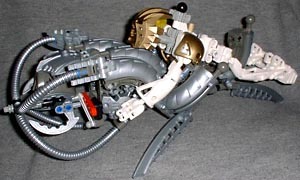 Takanuva rests horizontally on the bike, his hands plugged into the sides for control, which is where his longer neck comes into play: in order to make him look right, the toy is designed so that you can reposition his head to keep him looking forward. While this has always been possible with the Toa, the longer neck peg is intended to make sure the head is secure. Takanuva isn't the star of the new Bionicle movie Mask of Light, but he is its subject: the Toa and the Matoran are all searching for the hero that is destined to lead them from the darkness. Despite being the most expensive Bionicle set released this year, Takanuva and his Ussanui are definitely a fun addition to the line and are worth a purchase. What do you think 2004 has in store for the Bionicle story? Tell us on our message board, the Loafing Lounge.